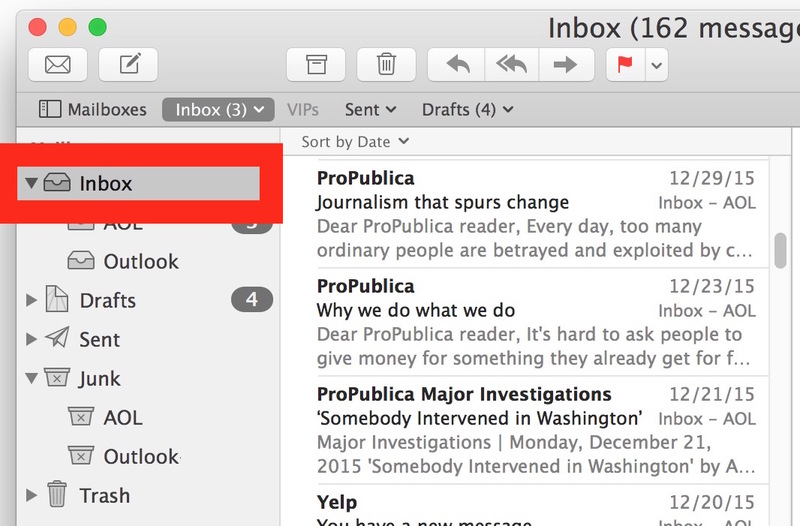 If you use the Mail app on a Mac, it’s fairly likely that you regularly delete emails that you determine to be unnecessary, junk, or that simply aren’t needed. 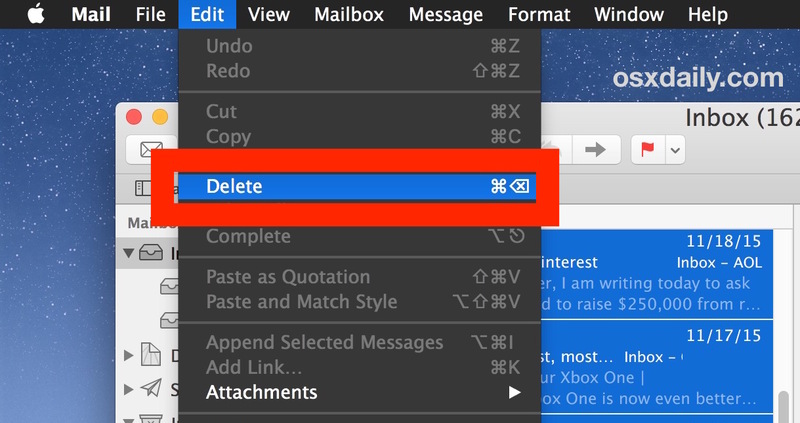 Typically this is a selective process where particular email messages are removed as needed, but in some situations you may want to go all out and delete every single email that is in a particular Mail account, or even remove all emails from the entire Mail app on a Mac, without removing the associated email account from Mail app. In other words, while the email messages are removed from Mail, the email account remains in Mail on the Mac so that it can continue to be used. You should be making regular backups of your Mac with Time Machine, so don’t skip a backup before you do this. If you do not have a backup made, and you delete all email in Mail app, those emails will be gone forever. Thus, this delete all emails approach should be used with discretion, and not applied universally just to declare email bankruptcy or clear up space. This is not a recommended action. 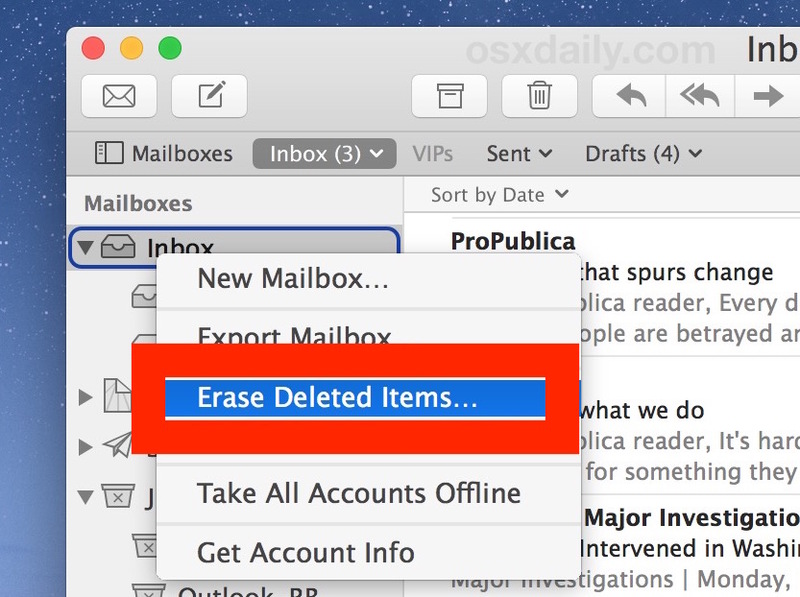 Outside of some specific reasons to delete every email from a Mac, this is simply not necessary for the majority of Mac OS X users, and you could end up removing emails that you wanted to keep. 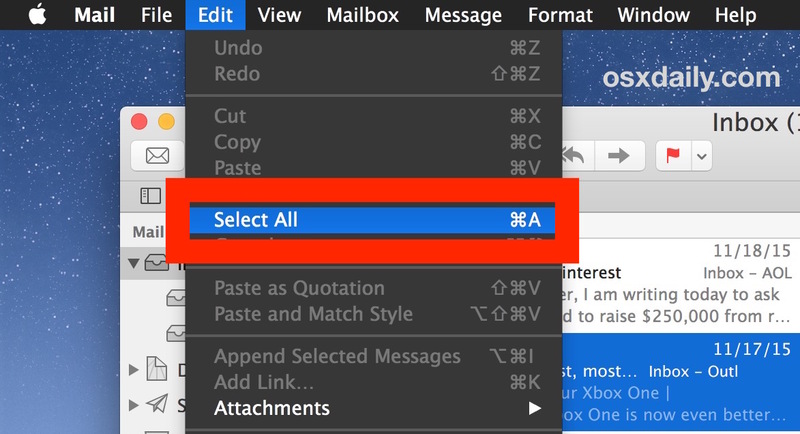 You can repeat the process with the “Sent” folder, the “Draft” folder, and other folders in Mail app if you want to as well if desired. This is really only necessary for particular situations with particular types of emails and Mail usage; perhaps you used the Mail app for a junkmail account and you don’t want the junk mail taking up space on the Mac hard drive any more, but you still want to email address itself kept around. 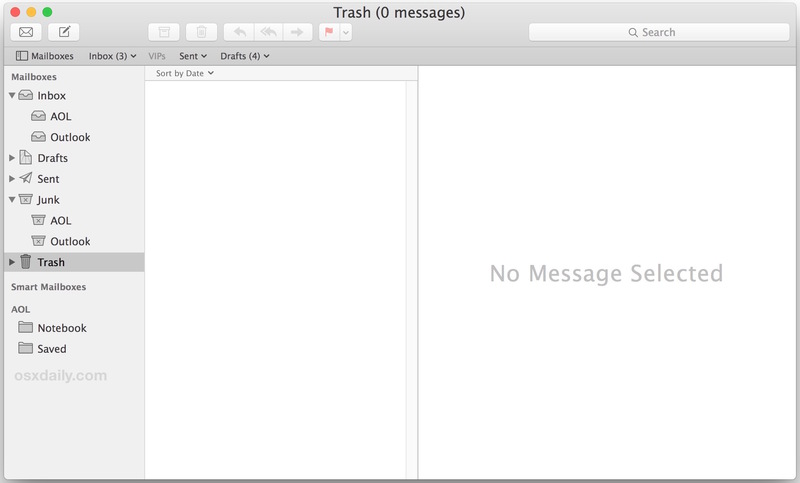 Or maybe you just want to declare the ultimate email bankruptcy by removing every message from Mail on the Mac. Many people who rely on web mail clients like Gmail, Outlook, or Yahoo never delete any email at all, and since it is stored on a remote server they don’t worry about any potential space the thousands of accrued emails can take up. That’s one major perk to using a web based email service, but for those who use the Mac Mail app you may be a bit more discerning. It’s worth mentioning that if you had the same email account setup on an iOS device, you may want to repeat the same process and delete all email from Mail on iPhone or iPad using a similar process, which, like the Mac approach, completely removes the emails from the iOS device, and is also irreversible (without a backup made, anyway). And again, this trick does not remove the email account from the Mac, it only removes the email messages themselves. The actual email account will stay on the Mac unless it is removed separately. b) all emails in all the mailboxes? I suspect from the detail re the Inbox, that this method works on specific Mailboxes, not all mailboxes at once. This deletes all emails from all mailboxes that have been selected, since we are selecting “Inbox” (which includes all mailboxes that have been setup in this case), thus it deletes all emails from all accounts. If you only select a single inbox (for example say, “Outlook”) to start with, it would remove all emails from that single account instead. Why not just set up the Mail >Preference > Accounts > Mailbox Behaviors to Delete the mail (Drafts, Sent, Junk, Trash) at a specified time? Much easier! If the Inbox has message you don’t want to read, hold the Command key down, Click on each message and delete sending to the trash which is set to delete in your choice of One day, One week, One month or when Quitting Mail. To send consecutive message to Trash, hold down the Shift key. I actually used this feature, before you came with it. I use gmail as my email provider, but mail get the emails too, as my gmail account has been set up in icloud as well. When I erased all messages,1.e. put them in trash/bin, it did the same for my gmail emails. which is not what i wanted/ Luckily I had not cpmpletely erased them amd now I vbring the gmail one, that I still need, slowly back…. I have had this worry also…about losing the actual Gmail archives when I delete the iPhone emails. I just tried this, and my entire Gmail account went into the Gmail trash folder. I think I was able to recover it. It was terrifying like you wouldn’t imagine. If you have your email setup as IMAP or Exchange ActiveSync on your iOS devices, you won’t need to repeat these steps. The emails will already be gone. It’s sad how brain dead a lot of people are about email. I have had to work with users who have 100GB+ mailboxes, and they insist that they need it all. It’s delusional. There is a far simpler way than having to do to any menus, simple go to the inbox, hold command A to select all, then hit delete, and ALL emails in that mailbox’s inbox to go the trash. No need to mouse thru drop down menus. I prefer keyboard shortcuts as well, but you won’t believe the novices who will complain about it not working since they can’t figure out the proper buttons to press, or they’ll press the power button and say it turned off their Mac. Better to direct the newbies to menus and specifics so they can’t break something in their Mail app. I’m doing the same exact steps over and over again, and when I click back on the ‘Inbox’ Tab, it still loads the same emails. Same with the ‘All Mail’ Tab, I do the same process, but is still the same. I did every single step and it will delete my emails, but when I click out of it and go back in they all reappear. What should I do? I tried to delete emails but failed with below message. “41304.emlx” couldn’t be copied to “Messages” because an item with the same name already exists. nope. i’ve done this dance for an hour now and gmail still keeps over 38 thousand emails in its ‘all mail’ folder. each time i do this dance it asks me do i want to delete 8000something messages i say yes and it just moves back and forth between trash and all mail folders. nothing happens. I currently have over 24,000 emails in my Mac Mail and a similar number in my folder for Mac Mail work (as I’m self employed) and then well over 48,000 in my Sent Items. Is there a way I could store say all these emails, say prior to 2012 separately, so that I don’t have this high number of messages cluttering up my Mac Mail …. I don’t want to erase them all, just move them elsewhere. I tried that and all my mail kept coming back. Then i found under the heading MAILBOXES ,synchronize, iCloud or the name of your email company. I chose my email company after i went to their web based email client and erased everything and then it was all gone.